Hair loss, it’s a problem many of us would like to avoid. Some people can experience hair loss gradually; however others can see their hair come out in larger clumps or at a rapid rate. Understandably, this can be quite stressful, cause anxiety and even low self-esteem. What Exactly is Hair Loss? The average person loses between 80-100 hairs per day. Hair loss can be described by many terms including; male pattern baldness, thinning hair, balding, falling hair, alopecia and receding hair line. These terms all refer to the same physical process but may have entirely different root causes which I outline below. Alopecia Androgenic – is an autoimmune condition which occurs when your immune system mistakenly attacks your hair follicles as though they’re a threat. This type of alopecia is the most common cause of hair loss and affects up to 70% of men and 40% of women. Men usually have a receding hair line, loss of hair in the crown or a bald spot or general thinning of hair throughout the top of the head. Women on the other hand usually experience gradual thinning of the hair throughout the entire scalp. Telogen Effluvium – A form of hair loss where more than normal amounts of hair fall out, this type of hair thinning is usually only temporary and the growth of the hair does recover. Alopecia Areata – Is an autoimmune condition which causes ‘spot’ hair loss resulting in single or multiple bald patches. Alopecia Universalis – Is the most advanced form or alopecia areata which results in total loss of hair on the body including eyelashes and eyebrows. Alopecia Barbae – Is alopecia areata that is localised to the beard area. It can be a single bald patch or more extensive across the whole of the beard area. What Cause Hair Loss & Baldness? Prescription medications: it’s important to note that many medications can have side effects that cause hair thinning such as; gout medications, prednisone, immune-suppressing drugs, anti-depressants, ACE inhibitors, HRT, blood thinners, beta-blockers, contraceptives and anti-seizure medications. Chemical Toxicity: the list of chemicals that may cause hair loss could be over a metre long, however I will list a few chemical agents that could possibly cause hair loss, including; pesticides, herbicides, radiation and chemo treatment, rancid oils, benzene, formaldehyde, x rays, ultra violet and radon gas. Malnutrition: malabsorption, poor diet, GI infection, eating disorders, anaemia and leaky gut can all contribute to hair loss as your body isn’t getting enough nutrients it needs to sustain hair growth. Poor Sleep: sleep is vital to allow the body to repair and regenerate it cells, including hair cells. Stress: it’s bad news for your health and your hair is no exception. In some cases stress can lead to hair falling out. When your body is stressed, it’s in survival mode which means oxygen is diverted towards vital functions and away from hair growth which is a non-vital function. Stress can affect the hair in other ways too as it uses up the body’s stores of vitamins and minerals. Autoimmune Diseases: if your hair loss is patchy rather than general thinning or receding, look to common autoimmune triggers for the answer. Healing your gut should be the first line of defence, which may be as simple as cutting out gluten, and increasing your consumption of bone broth and probiotics. It could also require more focused action, with something more along the lines of an autoimmune protocol. 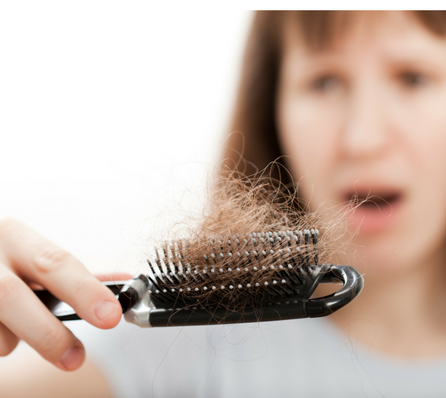 Hormone Imbalance: imbalanced hormones can contribute to hair loss. Anorexia Nervosa: when a person’s body is malnourished, such as during an eating disorder, the nutrient, minerals and protein stores in their body get depleted. When this occurs, the body has to make sure that it takes care of essential organ functions first. Our hair is made up of a protein called Keratin which is not as essential to our body’s functioning, so the hair growth stops to enable the body to focus on keeping that person alive. Anaemia: iron is an essential nutrient to many biological processes, especially the maintenance of healthy skin, nails and hair. Low Stomach Acid: stomach acid is required by your body to absorb iron, so if this is deficient it could lead to anaemia. Poor Diet & Nutrient Deficiency; a diet high in processed and refined foods is highly inflammatory, low in nutrient dense and nourishing foods that are vital for healthy hair growth. Zinc, iron, B vitamins, essential fatty acids, amino acids and other nutrients are responsible for hair growth. If these deficiencies occur for whatever reason, hair loss is likely. These deficiencies can result from many of the problems referred to in this article as well as poor diet. Celiac Disease, Gluten Intolerance or Sensitivity: Celiac disease is an autoimmune disease. In response to gluten consumption, the immune system produces antibodies that attack the lining of the small intestine resulting in malabsorption and inflammation. However, even if you don’t have celiac disease, consuming gluten can still be detrimental to your hair health as it can cause an inflammatory process in the body in some people which can cause hair loss. Trichotillomania: is the result of imbalanced hormones and neurotransmitters, and people suffering from this have an obsessive urge to pull out their hair on their head, eyebrows and eyelashes. Candida & Parasites: both have been linked to causing hair loss as they rob the body of nutrition. They live in the intestines and eat our food. They also prevent your body from absorbing vitamins, minerals and proteins necessary for hair growth. Exposure to Heavy Metals: Poor hair and nail growth as well as hair loss can be caused by toxic metals. Lead, cadmium, mercury, iron, aluminum and copper are the most common causes of hair loss. These are just some of the things that have been linked to hair loss, there are many more, however this is just a snapshot to get you thinking of what could possibly be the root cause for you or someone you know. A struggling liver, gall bladder, pancreas and spleen have been linked to hair loss at the back of the head. Pathogens, viruses, parasites, yeast infections should be looked into as well. Hair loss all over your head, could mean you’re very stressed in every aspect of your life, including nutritionally, emotionally, spiritually and physically. As a result this impacts your organs, your detox elimination pathways, hormones and sleep cycles. 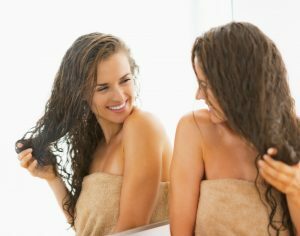 I’m sorry to say there are no instant solutions, magic pills or potions to cure hair loss (that I know of) however these are some methods you can try to get beautiful hair naturally. Switch to organic hair care products only: as the synthetic chemicals contained in conventional products can damage the health of your scalp and overall health. There are many safe non-toxic hair care products available nowadays to choose from. 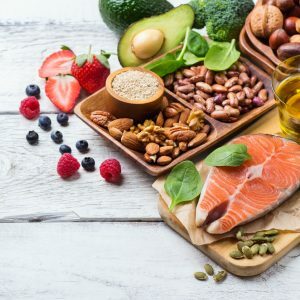 Eat Omega-3 Rich Foods: such as wild caught salmon, sardines, herring, mackerel, flax or walnuts, inca inchi and cod liver oil as these foods have been shown to reduce inflammation, lubricate the hair follicles and add elasticity to the hair. Biotin Rich Foods:a major sign of biotin deficiency is hair loss or thinning and brittle hair. Egg yolks are particularly high in biotin. Many women in particular become deficient in biotin during pregnancy because the rapidly dividing cells of the developing fetus require biotin for synthesis. Nettle for Gorgeous Hair: If there is one food that is truly medicinal when it comes to protecting and nourishing the hair, it is nettle. Nettle is one of the oldest remedies used for hair loss, dandruff and hair re-growth, as well as numerous other health benefits. You can buy nettle in tea form or as a supplement. Vitamin D: is a hormone that plays an important role in our bodies. Some research has found that people with the autoimmune disease alopecia areata have a Vitamin D deficiency. Direct sun exposure is the best way to absorb Vitamin D, plus you can detox your body with the sun. Aim for 15 minutes of sunshine per day so you can absorb 10 000 units of natural Vitamin D.
Vitamin B5: which is found in mushrooms, avocado, eggs, sunflower seeds, sweet potato and fish plays an important role in blood flow and hair growth while preventing hair loss and thinning. Vitamin B5 also supports the adrenal glands which helps to stimulate hair growth. Use a Wide Tooth Comb: a finer tooth comb can hurt the delicate new growth of hair, whereas a wider tooth comb is much more gentle on your hair and scalp. Wide tooth comb also provide massaging effect and help distribute your natural oil from the scalp to hair. Aloe Vera: boosts hair growth, prevents dandruff, adds shine and helps to stop hair loss. It also soothes the scalp and conditions hair. You can source natural hair care products that contain aloe vera or make a hair mask with aloe vera and apply this a few times per week. Rosemary Oil: is one of the first essential oils people choose to promote hair growth and reduce hair loss as it stimulates new hair growth and can be used to treat androgenetic alopecia. Add a few drops of rosemary oil into your shampoo and conditioner on a daily basis. 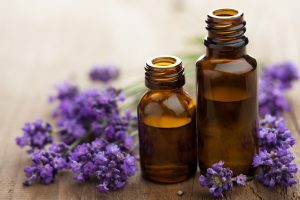 Do not use essential oils directly on the skin. Always mix them in a carrier oil or shampoo. Ginseng: can promote hair growth by stimulating hair follicles. 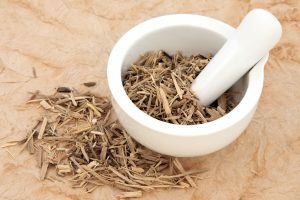 Ginsenosides are the active components of ginseng and are thought to be responsible for its positive effect on hair. Restore Stomach Acid Levels: work with a qualified practitioner so you can begin to absorb more nutrients necessary for hair growth. Zinc: has been used to treat alopecia areata. Zinc is an essential co-factor for multiple enzymes and involved with important functional activities in the hair follicles. It also has been found to accelerate hair follicle recovery. Manage Your Stress: you can read my tips on how you can manage stress here and here. Consume More Bone Broth & Gelatin: not only can you consume gelatin, you can also use it to make your very own gelatin hair mask. Gelatin and bone broth provides abundant amounts of calcium, magnesium and phosphorous which helps to build and maintain strong teeth, nails and hair. 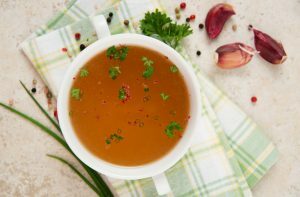 Use bone broth as the base for soups, stews, curries and gravy. You can use gelatin to make jelly, gummies and delicious panna cotta. Eliminate Gluten & Wheat 100%: as the protein in wheat causes problems with both your gut health and your immune system, creating a perfect storm for the development and progression of inflammatory and autoimmune disease. Even if you don’t have an inflammatory or autoimmune disease, eating gluten can still be harmful to your health, as it has been linked with more than 55 diseases. The bottom line is that if you have an autoimmune disease, or any inflammatory condition, you shouldn’t be eating gluten, period. You can read more here in my blog ‘Why you need to eliminate gluten completely if you have an autoimmune disease’. After even more information? Then read this blog, Could Baldness in a Young Man be Reduced by the Food Consumed? written by Cyndi O’Meara, founder of Changing Habits. Remember that treatments may take a few months to yield noticeable results. Be creative with the remedies and mix them up as much as you like. It’s also important you consider your diet and consume as many anti-inflammatory foods as you can to support your body and hair health. Disclaimer: it’s important you resolve medical issues. If you’re shedding too much hair and have nutrient deficiencies, are taking numerous medications, have an autoimmune disease, have been exposed to chemicals and so on we recommend you work with a functional medical Dr. and/ or practitioner so you can get to the root cause of your hair loss and begin the healing process. If you are facing problem of abrupt hair fall and hairloss this is the clear sign of poor health. Your health is lacking protein and essential minerals. Our body give clear indication that something is not good internally. hair fall is a one of the signs. So my advice is that if you are going through these kind of situation then don’t ignore its and alarm for you.